Jefferson dubbed the Newtown “The Prince of Apples” and grew them on his Monticello estate. The Newtown is making a comeback in the New York area thanks to Erik Baard, a Long Island City–based environmentalist. “Since 2006, Baard has spearheaded a local movement to plant Newtown Pippin saplings across the city and state. “I’m trying to remind New Yorkers of our agricultural heritage one tree at a time,” explains Baard, the borough’s own Johnny Appleseed. 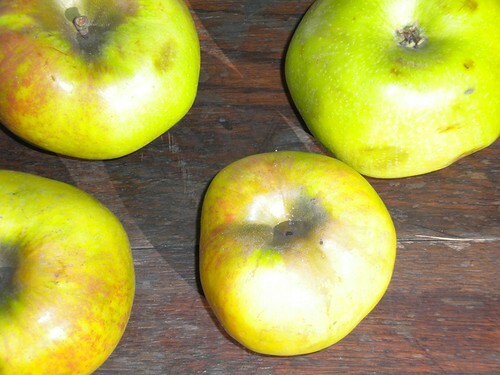 You can get your hands on Newtown Pippins in New York at the Red Jacket Orchard stand at the Union Square Greenmarket on Mondays. They sell other heirloom breeds including Baldwin, Staymen Winesap, 20 oz pippin and Northern Spy. I’m going to be featuring the Newtown Pippin at the Old Stone House event this Sunday: stop by to see the apples for yourself and for a taste of apple-rosewater tart.